The Kurt II Snake in the light gray color is a real must-have for the summer. The light grey gives a real summer look and therefore fits every outfit. We originally brought this KURT as the Sultan. This had a slightly different front with a straight line on the nose instead of the small brogue that the KURT has. Especially for the Limited Legends we have made of this variant a KURT. 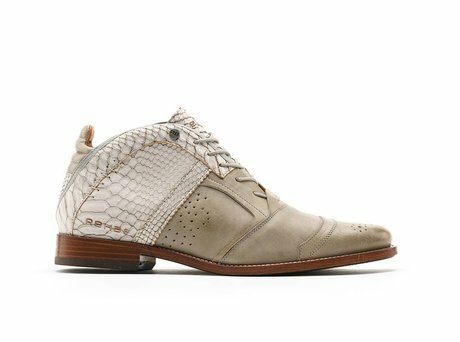 The half-high men's shoe is made of buffalo leather combined with a snake print on the back. This combination of material makes the shoe tough and tidy and therefore suitable for every outfit. Ontvang direct een e-mail zodra de REHAB KURT II SNAKE LL LIGHT GREY op voorraad is in jouw maat.